Until now we’ve avoided mentioning two French brands that belong with the best because their prices are preposterous for ordinary humans, namely Hermes and Louis Vuitton. That is not to say that their goods are not exquisite, if they are real. If an item with one of these brands is not exceptionally fine, it is likely a fake. Generally the higher the price of genuine goods the more likely they are to be knocked-off. On the plus side this is less of a problem for men than it is for women. The reason for that is, according to law enforcement, the most frequently copied goods are as follows: handbags, wallets, jewelry, watches, sports jerseys, and footwear. Unless you carry a pocketbook you are less likely to be stung than a woman will be, but then some don’t care. Louis Vuitton is most frequently knocked off, to the point where there are more fake goods in circulation than the real thing. You can be reasonably certain that women you see on the subway carrying Louis Vuitton are traveling with knock-offs. It also follows that if fakes are so ubiquitous the value of the real thing must be diminished as well. Hermes, while very expensive, is much more likely to be real. As this is being written there is a listing on Ebay for impossibly inexpensive “Hermes” as well as “Louis Vuitton” jeans. They happen to be from the same seller, and in fact on closer inspection they are the same exact jeans except for the label, which makes it obvious they are fake. If the price of something is too good to be true you should reasonably assume it it isn’t true. You’re either getting counterfeit goods, or a product from the designer’s crummy mass market line, usually made in China. Many top (but not the very top) designers have multiple lines. Thus the good stuff from Giorgio Armani is in the Armani Collezioni, or in the case of Calvin Klein, the Calvin Klein collection, with the rest of his lines being less than high quality. It is noteworthy that both high-end collections are made in Italy. A leather item in the “collection” will likely be glove soft, while the ‘jeans” or whatever “other” line they sell will be hard and coarse. Other top brands, such as Gucci, Kiton, Brioni, etc. take pride in their products and don’t produce mass market lines. Gucci is the most likely to be knocked off, but again quality, along with a too-good-to-be-true price is your surest guide to authenticity. In the case of Brioni there is a line of relatively inexpensive suits being sold by one “Bianco Brioni.” That may be his real name, but it has nothing to do with the authentic high-end Brioni brand, according to Brioni. It is easy to see why. “Brioni” is not the name of a person but an island in the Adriatic that was used when the exclusive brand was founded. The basic truth is that quality brand items at a low price can only be fake or used. The latter is the one instance in which you can occasionally find real bargains, i.e. on Ebay in terms of authentic used items that haven’t really been used much. For example, a wife may have bought her husband something he doesn’t really like and wouldn’t wear, so she has to sell it at a steep discount. Or someone has an article that just doesn’t fit them and they can’t return it. I would not recommend buying anything with much more use than that unless you’re dying for it in any condition. An exception would be something like jeans, which you’re getting broken in and still look good. These kinds of “used” items are much more likely to be genuine than something “new” at an impossibly low price. That’s still no guarantee, but it is at least the one window where you can possibly find legitimate high end stuff at a low price. Given the overwhelming informality characteristic of our times, and the resolute nonjudgemental attitude that most people have towards dress, it is a legitimate question to ask why one should bother getting dressed up. One reason is work, i.e. at a bank or other occupations, where appearance and decorum are important, although they are declining in number. Another is the reality that dress is the most important way one presents oneself. Another is connoted by the very term "dressing up," which implies some sense of moving towards a more rarified environment. Then there are times and situations where one simply does not care how one is dressed. This might be the case at home without visitors, or in the high heat of summer, or dead cold of winter, where comfort and protection against the elements trumps everything else. Obviously one is more interested in being warm than fashionable. Then there is advancing age, to the point where many people don't think much about how they are dressed and could care less. But for everyone else there are times when it is necessary and/or appropriate to get dressed up, or at least be wearing attire appropriate for the occasion. Why does it still matter then? When you get dressed you are not only presenting yourself for yourself alone, nor is it just a matter of making a good impression. It is, in fact, a signal of how you regard the people you are addressing or interacting with as well. Being properly dressed for an occasion is also a sign of high regard for others. It is a way of communicating that you take them seriously, hold them in some degree of esteem, and that you care enough about them to want to elicit a favorable impression. It means, in the case of addressing an audience, that you respect them. There is a reason that people like newscasters, politicians and lawyers are dressed up. They must convey sufficient gravitas to be taken seriously by their audience. For the fact remains that the man in a suit is perceived differently from one who is casually dressed under many different circumstances. Look at the classic film actors on our masthead. They are men, and look like men in a way that today’s boyish actors, fond of dressing down, do not remotely resemble. They convey a certain authority that is impossible for today’s stars. Apart from questionable taste on the wrong occasions, all of this conscientious dressing down simply sets another standard, albeit far more casual. The result is casual wear that escalates in price, beyond all reason, according to fashionability. So even though the man in the suit has, in many circumstances, been replaced by more casual dress, the latter simply becomes another mode of dress with all the considerations that go into wearing a suit. We’ll explore this further next time. Given these numbers, what will work for a shirt won’t work for a sweater, since you are going to want a looser fit, so you may need to go up a bit. 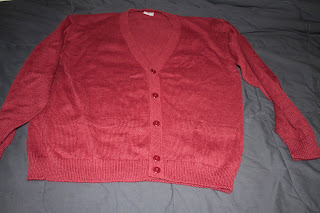 When in doubt go larger because nothing looks worse than a tight, poorly fitted sweater on a man. With a larger size you can bunch and fold, and it generally will be more flattering to your silhouette, provided it isn’t overly long. A good fit will have room around the belly, so that if you happen to protrude there it won’t be as noticeable, as well as around the neck, so you don’t feel constricted. With a sweater the most important measurement you can make is armpit to armpit, which when doubled should equal your chest size. As long as you exceed that number comfortably you’re fine. Good sweaters usually come in wool, or wool blend, or cashmere/cashmere blend, but the 100% pure variety is generally better than a blend with some cheaper fabric. In the winter nothing keeps you warm like a good, two-ply cashmere sweater. There are, however, different grades of cashmere. Good cashmere will be covered with a kind of plush fuzz, whereas with cheaper cashmere you’re more likely to get piling. The best cashmere comes from kashmiri goats from Mongolia. The fibers are actually combed out by the herdsmen, and the harsh conditions produce a fabric, which, when loomed, provides the tightest, most effective insulation. The finest wool comes from New Zealand Black Forest Merino sheep. Merino originated in Spain, but is also produced in Australia, the US, and South America. The fibers are fine and soft, and there are different grades, the best of which is ultrafine. Loro Piana, which makes some of the finest fabrics anywhere, holds a contest every year to find the best wool in the world. There are many other varieties of wool, with names like Shropshire, Hampshire, Debouillet (a type predominant in the US), etc. and distinctive forms, such as tweed from Scotland. Worsted wool is more of a process that results in wrinkle-resistant fabric used mainly in suits. 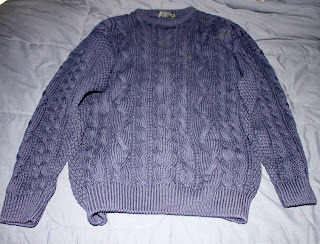 Wool is static resistant, as well as sometimes even water resistant, due to lanolin, like an Irish fisherman’s sweater from the Aran Islands, or a New Wool sweater from England (called Virgin Wool in the US), as in the photo below. These are thick and warm, which is ideal for cold weather. This is not something you want to get natural and untreated, since the lanolin smell is quite pungent. When it is processed or dyed the smell is removed. 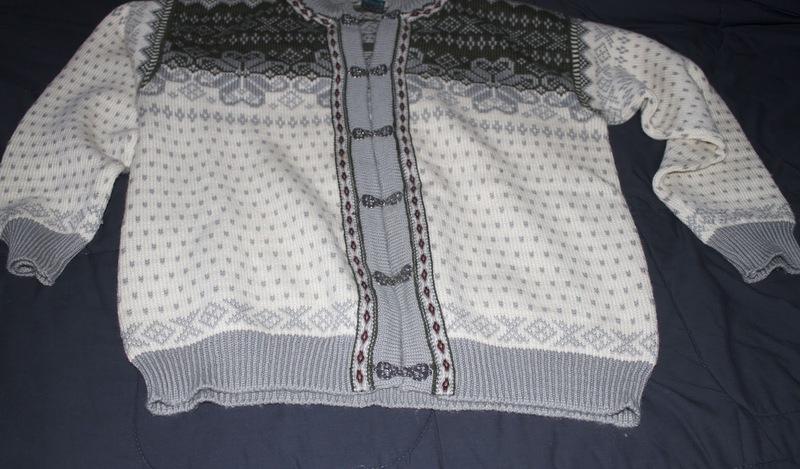 Norwegian sweaters that are still made in Norway, such as the one below, are also excellent. 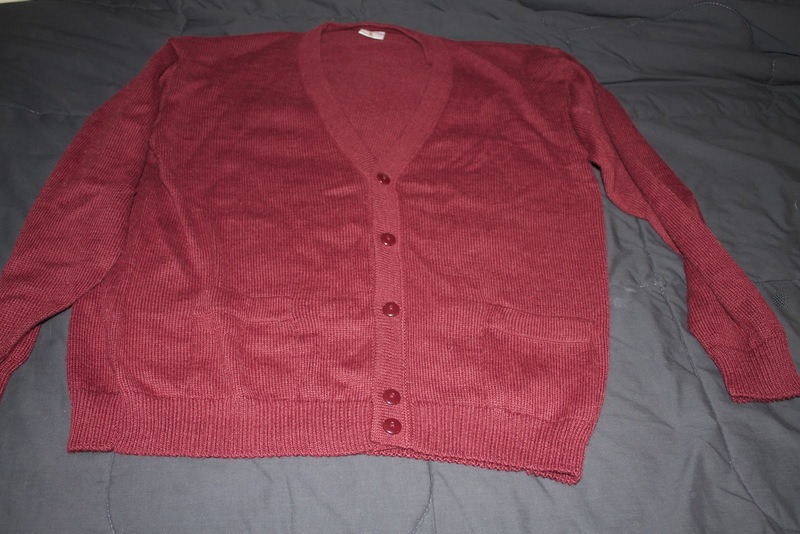 Other fabrics from South America, like Vicuna (the rarest of all), and Guanaco, make great cashmere-like fabric, as does the superfine grade of the more abundantly available alpaca, which the cardigan below is made from. For warmer weather cotton or cotton blend sweaters work well, although a heavy cotton sweater is also suitable for winter, such as the Coogi sweater below. 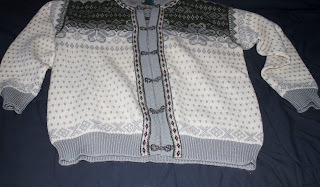 In addition to cotton, fine, lighter sweaters like the one below, are made from silk (usually raw silk),silk blend, or linen/blend. 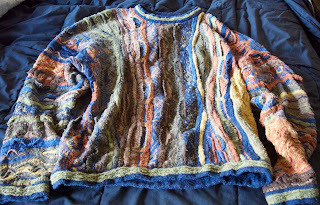 Natural fabrics breathe well and stand up to use, however you can sometimes find good sweaters that blend natural fibers with man-made material such as acrylic threads. 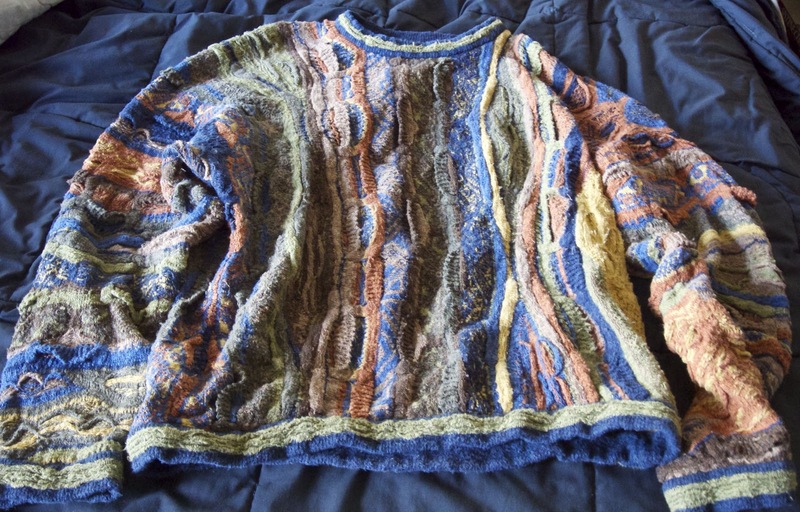 However, generally, the woolly fabrics mentioned above remain the primary material for sweaters, especially in cold weather. Unfortunately, they are also preferred by moths, which always seem to zero in on the finest cashmere first, so you need to have a good supply of cedar blocks or other moth deterrent. 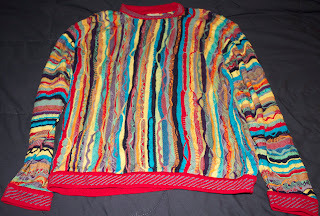 You can also bag this kind of sweater, but it is better to let it breathe if your storage is moth-proofed.